The near football-pitched sized Arlington Sq resplendent with bulbs donated by Taylor’s Bulbs through MPGA’s Bulbs for London Scheme. Recently I had the pleasure of visiting an amazing community project in Islington, North London. 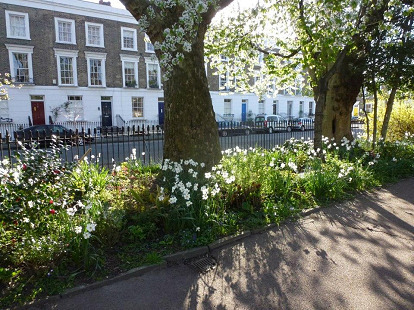 Based within a conservation area in the westerly part of Islington, this community project centres around the continued development and maintenance of 3 closely-related London squares, the main one being the largest, Arlington Square, which is just under one acre. The square is just one of approximately 200 sites across the capital to have received bulbs through an amazing initiative set up by the MPGA in 2012 in collaboration with Taylors Bulbs of Holbeach. Prior to this they had also been the recipient of a regular grant from the MPGA for the planting of one of the perimeter beds by community volunteers. After a thorough browsing of the Association’s – well designed and easy to navigate – website I chose a rather cold and somewhat rain-threatened day to make my first visit. Following the completion of a recent garden project, Arlington Square chose one of their monthly garden volunteering days to celebrate and remember the life of Elspeth Thompson who died in 2010. Elspeth was a huge supporter of the National Garden Scheme; she wrote a regular column in the Sunday Telegraph and was passionate regarding the potential community gardening has in bringing both people and plants together. So it was then, in that same spirit, that my visit coincided with a morning’s community gardening at the square, followed by celebratory drinks and the placing of a plaque in remembrance to Elspeth. A 15 minute walk from the Angel tube station, dodging sharp showers through London’s diverse streets took me to Arlington Square. Arriving a little late I was relieved to find 3 or 4 of the association’s stalwart characters still there, busily relaxing in post celebration wind down mode. Alison, Gordon and Paul busy watering dry borders (despite the rain!) holding the Elspeth Thompson commemorative plaque. A couple of feet of Arlington shade! 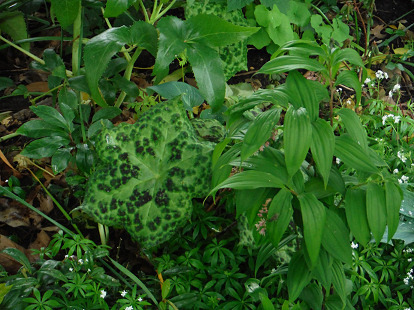 Solomon’s Seal, Hellebores and ‘Spotty Dotty’ (Podophyllum hexandrum) give plenty of variety for the curious plant lover. As with so many of London’s garden squares, Arlington also suffers somewhat from the challenge of planting in some very shady borders. As well as being a major global capital city, London is also known for its many green spaces: its parks and gardens, heaths and squares. Of course, London is full of diversity and contrast, and it’s true to say that in London despite never being more than three paces away from a rat (allegedly!?) you are also never far away from a verdant and peaceful haven. However, they often are so very green! Walk into most garden squares and you will usually find yourself immersed in much greenery… plants suited to shady conditions, producing as much chlorophyll-filled foliage as they possibly can, desperate to maximise on the slightest sliver of summer sun in which to aid photosynthesis. The perimeters of London squares are commonly lined with mature trees, (often London Planes) and it is Alison, Gordon and Paul busy watering dry borders (despite the rain!) holding the Elspeth Thompson commemorative plaque. with these conditions in mind that the skilled gardener has to rise to the challenge of designing borders that can still offer variety (heights, textures etc) and seasonal diversity too! Even if it is in the name of horticulture, you have to feel for poor chap standing at the pay & display machine! Speaking to Paul Thompson-McArthur (the square’s horticultural consultant) he told of an approach to planting and design that takes its influences from the natural woodland floor: a site, soil and aspect that mimic the conditions so often seen in our London Squares. 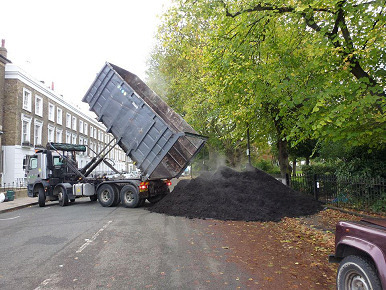 In the autumn of 2013 an all-hands-on-deck approach helped distribute and deposit over 15 tonnes of compost on to the dry and compacted soil. Instantly this helped to turn an almost dust-like and nutrient deficient soil into one fertile rich and more workable, again emulating a woodland floor which for years has been nourished and made fertile by tons of natural leaf fall and plant matter forming layers and layers of nature’s mulch. Paul, a gardener and garden designer working in the locality, is well-placed to advise and consult on the planting within the Arlington Squares. Designing beds, borders and gardens within towns often means working with shade in mind. Tall buildings, with low gardens completely change the plant pallet available to those with the luxury of a more open aspect. No doubt the pages within his plant books and encyclopaedias are slightly more thumbed and dog-eared at the “Plants for deep shade” sections! Gordon (the association’s chair) approached MPGA back in the Autumn of 2012, applying for several varieties of free bulbs through their Bulbs for London campaign. A mixed bag of bulbs containing winter aconites, snowdrops (singles & doubles), grape hyacinths, Narcissus and Fritillaria meleagris (Snakes Head Fritillary) were supplied by Taylor’s Bulbs and were quickly planted up by the association’s many volunteering hands. Bulbs work brilliantly under such conditions, remaining dry in summer borders – protected by a tree’s canopy – whilst getting the maximum sunlight sitting under deciduous trees in winter. After long, dark and damp British winters, these harbingers of Spring really do lift the spirit, reminding us that summer is just around the corner. Bulbs are perfectly designed to be squeezed in-between permanent plantings of trees, shrubs and herbaceous perennials. So many great things to say about bulbs! Virtually maintenance free, these little time capsules of beauty bulk up naturally year after year and offer something very special to Spring borders! 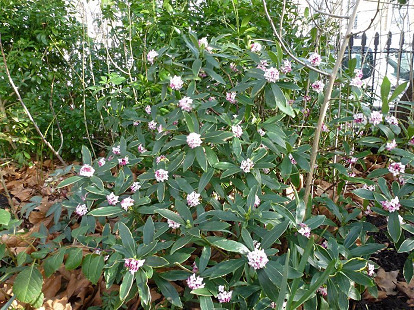 Daphne odora ‘Aureamarginata’ – sweetly scented, yellow-margined leaves and loves a part-shade aspect. I very much enjoyed meeting Gordon, Alison and Paul and chatting to them about their beloved garden. 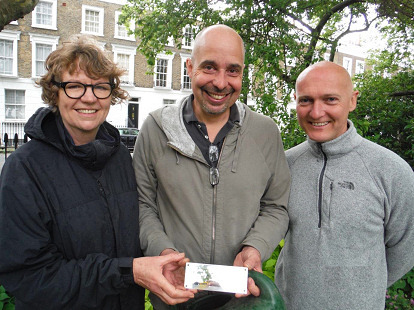 They were full of praise for the MPGA and Taylors who together, through the Bulbs for London scheme, have helped to brighten up over 200 gardens across London. The community at Arlington Square should be very proud of the work and effort that goes into creating such beautiful gardens. Its work is deeply rooted around a love of both community and plants, with the constant aspiration to bring harmony and cohesion to both these groups. 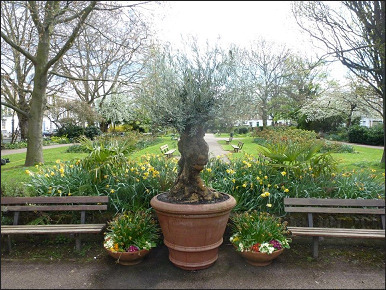 This entry was posted in London Gardens and tagged Arlington Square, Islington, London Gardens, North London on May 5, 2014 by admin.